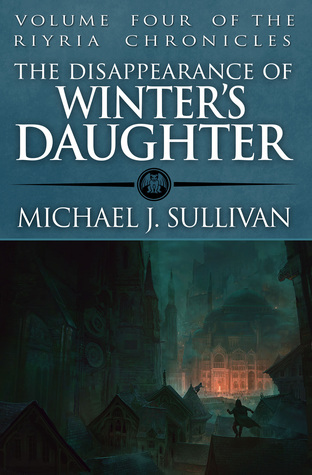 First off, I want to thank Michael Sullivan for giving me the opportunity to gamma read The Disappearance of Winter’s Daughter (Riyria Chronicles, #4). This is the first full-length novel by Sullivan that I have had the chance to read, having listened to The Jester and Professional Integrity on Audible, and I can safely say that the rest of his novels have progressed up my TBR. Sullivan states that TDoWD was written, and can be read as, a stand-alone novel in the Riyria Chronicles and I can attest to that. No prior knowledge of Royce and Hadrian’s forays is necessary to read and enjoy TDoWD, but there are a few nods to previous books in the series that knowledgeable readers will enjoy. Though none of these nods provide a deep impact on this story, the author does explain some of them, in depth, at the end of the novel. Royce and Hadrian, everyone’s favorite ex-assassin and ex-merc duo, are on yet another adventure. This time, there are coming to the aid of wealthy whiskey baron, Gabriel Winter. Fraught with rage and enough gold to set Royce and Hadrian up for retirement, he sends them to Rochelle to search for his missing, and presumed dead, daughter. The human population of the city is in the midst of preparing for a new king to be crowned and putting on the largest feast of the year, while the inhuman minorities are plotting chaos, bloodshed, and new world order. While the duo make their way through Rochelle, odd occurrences of statues coming to life, unmanned wagons plummeting through the streets, and crazy inn-owners create about as much chaos as they can take on an empty stomach. Sullivan writes with a prose that is easy to follow, yet descriptively beautiful enough to keep your eyes scrolling through the pages. The storyline is straightforward and mostly runaway/chase action rather than swordplay, but there is enough there to keep things interesting. The characters are likeable and humorous, though there may be a couple that tend to get on your nerves. The setting and scenery are gorgeous and Sullivan paints everything in vivid detail. The only thing I wish had turned out differently was around 85%. I feel the author could’ve really expanded upon some of the scenes/ideas that led up to the ending, but it isn’t enough to complain about as the ending was perfect. All in all, if you are a fan of Sullivan’s previous works, of course you are going to purchase TDoWD. If you are an avid or casual fan of fantasy and haven’t read anything Riyria yet, I suggest grabbing a copy and seeing if it has the same impact on you.